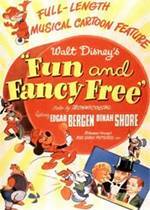 Listen to all the actors who have voiced the following Fun and Fancy Free characters. Shows: Donald Duck's 50th Birthday, Mickey Mouse Club, DTV Valentine. Movies: Mickey Mouse Clubhouse Road Rally, Babes in Toyland (1961), Mickey's Christmas Carol. Games: Disney Magical World, Disney's Arcade Frenzy, Kinect Rush: A Disney Pixar Adventure. Shorts: Mickey Mousekersize, Mickey Mouse (2013), Pluto.